Coach introduces AJ Styles and asks how he is feeling after going through a table, and Styles says he just has to get back up and go. They talk about Enzo Amore’s injury at WWE Payback, and Styles says it’s not ballet, and it was hard to watch, but they will take care of Enzo and make sure he gets all the necessary tests to continue competing safely. 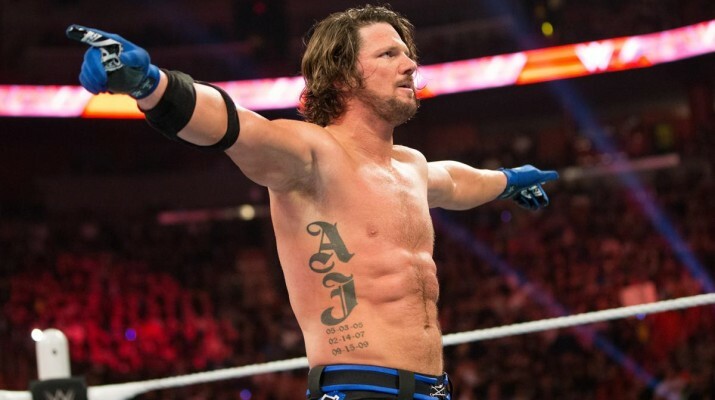 AJ Styles talks about thinking he would never make it to WWE, and says it was a bit sad thinking he wouldn’t ever get the chance. Coach asks about his debut at the WWE Royal Rumble, saying he was really nervous, but felt better once he walked down the aisle and it was cool. Coach says social media plays a bit part in discovering people now, and Styles says social media without a doubt helped him become as big as he is. Coach then asks about Styles’ Wrestlemania debut, and Styles says it’s hard to express, but it was really easy to work with a guy like Chris Jericho because you could just work and focus. Coach references Styles telling him facing Shawn Michaels would be a dream match for him, and Styles says Michaels made everything mean something. He says Michaels did the little things that mattered and he admires him, and would like to be more like him. Coach asks if Styles thinks he could talk him out of retirement, and Styles says he’s heard Michaels won’t ever come out, and he deserves the retirement. Coach references Styles listening to Christian hip hop and he names a few favorites, then they talk about playing video games. Styles says he doesn’t have a great accent like his without loving college football, so that’s what he will stick with, then Coach thanks him for being on the show.